Neal said in a brief statement only that he had received Mnuchin's letter and that he was consulting with legal counsel, promising a response "in the coming days." Neal filed a formal request with the Treasury Department for the documents last week, saying, "I am certain we are within our legitimate legislative, legal and oversight rights." Mnuchin said at a Ways and Means hearing last month that he would protect Trump's privacy. In his letter to Neal on Wednesday, Mnuchin cited the committee's previous finding, when it was under Republican control, that such a request would be an "abuse of authority" that would "set a dangerous precedent" by targeting an individual's tax returns for political reasons. "The legal implications of this request could affect protections for all Americans against politically motivated disclosures of personal tax information, regardless of which party is in power," he wrote Wednesday, saying he was consulting with the Justice Department about the legality and constitutionality of Neal's request. Since he was a candidate, Trump has claimed that he can't release his taxes because he's under audit by the IRS. But in congressional testimony in February, Michael Cohen, Trump's former personal attorney, said he'd seen no proof that any audit was under way. And tax experts have said that even if he is under audit, there's nothing to stop Trump from releasing his returns. 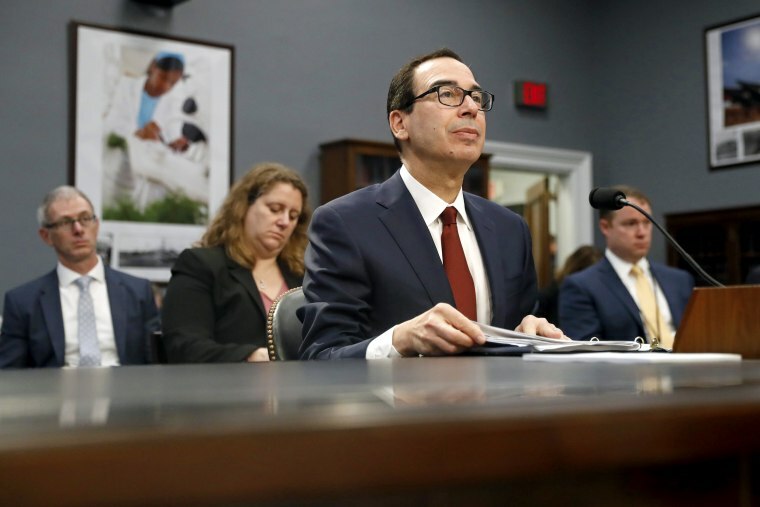 Rep. Kevin Brady of Texas, the ranking Republican on Neal's committee, welcomed Mnuchin's letter, warning that the request "sets a dangerous precedent." "The tax code must not to be used for political fishing expeditions," Brady said. "The Treasury Department is right to carefully review the privacy impact this request would have on every taxpayer." Ways and Means is one of three congressional committees with the authority to seek to obtain the president's returns. The others are the Senate Finance Committee and the Joint Committee on Taxation. Separately, Democrats in New York, the president's home state, introduced a bill in the Legislature on Monday that would allow the state to release any state tax return requested by the three congressional committees. The bill would apply only to Trump's state returns — not the federal returns that Neal is seeking — but because the president's businesses are based there, his New York returns are thought to be likely to include much of the same information.